Thurn and Taxis is a family board game for two to four players aged 10 and up, that takes around an hour to play. It cleverly combines hand management and route building, seeing it win the coveted Spiel de Jahres (German Game of the Year) Award in 2006. This is very typical of games coming out of Germany at the time and thus often divides opinion: the game’s ‘theme’, which is very thinly pasted on, covers the establishment of German postal routes across Bavaria and beyond in the 17th Century – not one to get the heart racing! The brown of the box continues inside, with many of the components sporting ‘the beige, with more beige’ colour scheme derided by some (particularly in the US); but if you can see past the colour scheme, the artwork and graphic design and clear and simple. In the box you’ll find a beautiful (if very beige) board, 86 small (Ticket to Ride sized) cards, 80 small wooden post offices, 20 cardboard chits and four cardboard player aids. You can still easily find the game for around £30 new (or £20 second hand), which is cheap by today’s standards. Thurn and Taxis is in the same family as Ticket to Ride, Catan and Carcassonne: classic German games you can pretty much teach anyone, as they have familiar and simple rules – but that also enough depth to hold the attention of more experienced gamers. The board has 22 locations and each player starts with 20 post offices they will try and place on them (so you can’t complete them all). You’ll lose a point for each unplaced office at the end of the game, while each city falls into a region – and completing these regions will score you some bonus points (decreasing for players completing them after the first). There’s an additional bonus for placing in all the different coloured regions. Each location has three identical city cards (so a 66-card deck). Six of these are visible at any time (think Ticket to Ride), or you can draw blind from the top of the stack. What really makes the game sing is the order in which a turn is structured: draw a card; play a card to your tableau to continue your route, then choose whether to complete your current route (by using all the cards in your tableau). All the cities are linked to at least one other (up to seven) by roads. Any card you play into your tableau (after the first) must continue the route you start in either one direction or the other – but you can only add to the two ends. This means that, if you didn’t have a card in hand at the start of your turn you can add – and if you get unlucky with your card draws – you may have to discard your route and start again. You can only lay a route once you have three cards in your tableau, but waiting longer gives you point bonuses (a seven-city route is very lucrative). When you turn in your route you can place an office in any towns you don’t yet have one, but you can only place either in one colour (so ,for example, four grey cities), or only of each colour (so a grey, a blue, a red etc). Regardless of the amount of cities you place, all the cards in your tableau are discarded and you’ll start a fresh route next turn. When you complete your first three-card route, you receive a bonus carriage (worth two points). If you later complete a four-card route, it will be replaced with a three-point bonus and so on – right up to a 10 point bonus for completing a seven-city route (having also done a five and a six – you can’t skip these bonus levels). If someone claims their 10-point bonus, this also ends the game (as does someone placing all of their offices), so you have two routes to victory. Finish the round, most points wins. The writer: While many disagree, this is one of my favourite Spiel de Jahres winners (just behind Ticket to Ride). It’s a very simple game to teach, can be played by players of all abilities, and has enough luck in it to turn up some surprise results. But at the same time, an experienced player will begin to find more strategic and tactical depth that should, in the long run, give them an advantage over time. Despite being well over 10 years old now the game is still in print too – not something some of the other previous winners can claim. For me, that is for one simple reason: it has easily stood the test of time. The thinker: While Thurn and Taxis ha a lot of luck in terms of the random draws, with a deck of just 66 cars it is quite easy for a player with good memory to follow certain cities and to know the chances of what you need coming out soon. You can also play safer by playing slower, but this of course opens you up to defeat by more reckless (and of course lucky!) players. The two ways to win can also make for interesting pacing, as a player rushing to victory via completing the bonus carriages can devastate those playing the long game – but not every time, as the slow player can collect some large bonuses too. A very good tactical game. 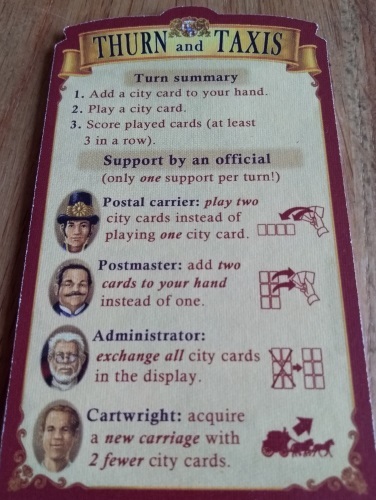 The trasher: Each turn you can use one of four officials as a bonus action: take two cards instead of one; play two cards into your tableau instead of one; refresh the six visible city cards, or get a bonus carriage even if you’re up to two cards short of the amount you need (when you complete it at the end of the turn). This makes every round really tactical, while also giving you a better chance of flying by the seat of your pants if you want to push your luck to get that exact card you need. But you can also clear the decks if there’s a card there you’re pretty sure the next player is going to need! The dabbler: I wasn’t wowed by the beige and typically German box cover of Thurn and Taxis, but at least the lady on the front is smiling: a fair reflection of what turned out to be a thoroughly enjoyable, if themeless and bland looking family game. You have to wonder a how a re-themed version in space, or a board that pops a little and some nice plastic pieces (a la Ticket to Ride) may liven things up a bit – but really, who cares? It’s a simple teach, easy set up and plays fast – yet every turn you have genuine decisions to make. Against the odds on first viewing, this is now right up there on my list of favourite games. Even Thurn and Taxis detractors don’t claim it is a bad design, but you see phrases such as ‘puzzle’, ‘optimising’, ‘themeless’, ‘abstract’ and ‘low/no interaction’ in the same sentences as those branding it ‘boring’. As I often say to this kind of criticism, you’re not judging the game, you’re judging your tastes. No, it isn’t for everyone – only family gamers who like a thoughtful euro element need apply. And I do feel, more than any other game, it suffers for its similarities (and closeness of release) to the behemoth that is Ticket to Ride. Interestingly people almost equally describe it as both TtR+ and TtR Lite, which probably just proves that while the games share similar basic components they are actually very different beasts. Generally though, I would definitely suggest trying the other: but I find the experience they bring very different. They share a similar level of luck and planning, but TtR is much more combative and obviously interactive. Speaking of luck, while Thurn and Taxis definitely has it, an experienced player who reads the deck will tell you that there’s much less luck here than in Ticket to Ride. I’ve had games of Ticket to Ride where I know I’ve lost due to a colour simply not coming my way, or because of accidental blocking; where in Thurn and Taxis it will be because I’ve taken a risk and it hasn’t paid off – or someone else has simply played better than me. Again, this is either going to appeal to your or not. Finally, despite it having some seriously harsh detractors giving the game more than the average very low scores at Board Game Geek, the game is still ranked well inside the Top 100 family games and inside the top 350 games overall. Thurn and Taxis could well be the most euro-ey euro of them all, while also being the more euro and worse looking cousin of one of the most celebrated games in the hobby (Ticket to Ride): neither of which enamour it to many modern gamers. But for thoughtful family and light euro gamers this is a genuine classic you should definitely try. While I have quite deliberately not played it to death (once per month feels about right for the base game), this has become one of favourite family games. But it also has two expansions which add a little extra to the mix, so if it does become a favourite there are options to add a little variety too. Highly recommended.